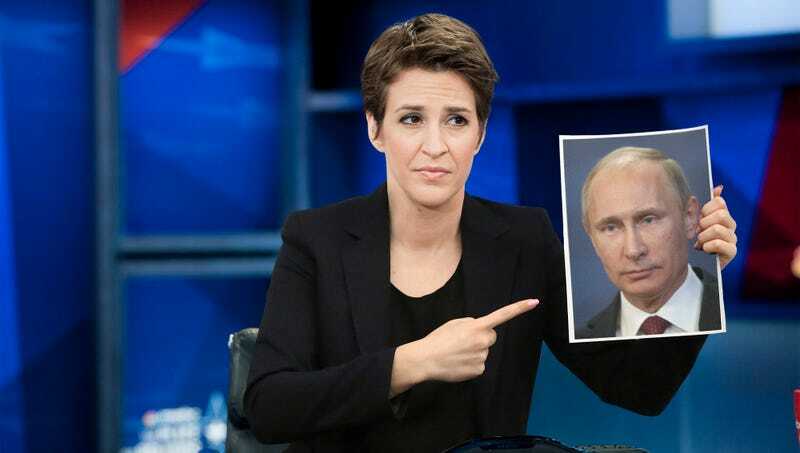 NEW YORK—Enraged to the point that she was no longer able to form words, a fuming Rachel Maddow spent an entire episode of her show Thursday just pointing wildly at a picture of Russian president Vladimir Putin. For the first segment of the program, the political pundit reportedly jabbed her finger at Putin’s photo as her facial expression shifted from angry to sad, then back to angry, and finally to disgust. When she returned from a commercial break, Maddow was already shaking her head indignantly, proceeding to alternate between gesturing impatiently at the Russian leader and pointing directly at the camera. Sources later confirmed that the seething television host concluded the episode by sitting across from a guest who had written a book about Putin, which she grabbed out of the author’s hands and slammed down on her desk six times in a row before shaking her head and muttering unintelligibly. At press time, MSNBC sources confirmed that Maddow’s ratings had reached an all-time high.